A Russian Proton rocket is hoisted into launch position for the Aug. 17 launch of the new Express AM4 communications satellite from Baikonur Cosmodrome in Kazakhstan. PARIS — The planned Dec. 27 launch of the SES-4 commercial telecommunications satellite was scrapped just hours before liftoff and postponed for several weeks when ground teams detected off-nominal telemetry from its Proton rocket’s Breeze-M upper stage, launch services provider International Launch Services (ILS) and satellite owner SES announced Dec. 27. 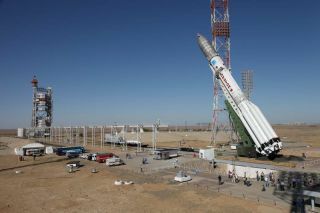 The Proton vehicle will be removed from its launch pad at Russia's Baikonur Cosmodrome in Kazakhstan and returned to an assembly and test building, where the suspected avionics unit will be replaced, Russia’s Roscosmos space agency said. Reston, Va.-based ILS and SES of Luxembourg said the launch, which would have been ILS's sixth of the year and the 10th Proton launch overall when Russian government missions are included, will be delayed for about 25 days. SES-4, built by Space Systems/Loral of Palo Alto, Calif., will be the biggest satellite in SES's 50-satellite fleet once it enters operations at 338 degrees east. Weighing 13,600 pounds (6,180 kilograms) at launch and carrying 52 C-band and 72 Ku-band transponders, SES-4 is designed to deliver 20 kilowatts of power to its payload at the end of its 15-year life. SES-4 will replace the NSS-7 satellite currently at the 338 degrees east orbital position and will offer telecommunications links in the Americas, Europe, the Middle East and Africa.